I’ve known it’s been coming for a while and have been eagerly watching my stats, but Sunday at 12:23pm EST my blog officially passed 1 million views!! I am unbelievably excited about this. Even after blogging for so long, it’s still hard to believe that there are so many people out there reading the really random things I like to talk about here, but I am thrilled. Simply thrilled. My blog officially turns 6 years old in a few weeks and I’m planning to do a sort of 6-year, 1,000,000 view review then, but for now let me just say thank you to everyone who has ever visited my blog. To those of you who read regularly and/or comment on posts, I really, really appreciate the support that you especially have shown toward this little insect blog. I have enjoyed getting to know some of you in person and interacting with others of you regularly online. I look forward to many more conversation and celebrations of insects with you all! Congratulations! That is a big milestone! Congratulations. I think this is my first comment, have been reading your blog for years and love it. Thank you! Aw, thanks for commenting! It’s nice to “meet” you finally! Very much looking forward to that review and CONGRATS! Thanks Cecelia!! Appreciate all of your comments and support! Thank you for sharing those interesting and informative articles with us. Congratulations! CONGRATS Chris!! Of course, you know you are WAAAAYYY over the 1 million mark b/c folks like me who subscribe to your posts don’t have to GO to your website to read the whole post! I’m so thrilled that this has gone so well for you. you’re my inspiration and role model – though I’m not doing the best at blogging consistently yet – there have been a lot of things get in the way. still I’m making great connections and several new opportunities both in the “human birth” world AND the scientific world have started opening up. just applied for a science communication internship here at the u too. we’ll see what happens. it’s something that you do on the side for a year. would give me exposure to new forms of media. anyway – congrats again. loooking forward to 1 million more! Awww, thanks Anne! That’s so very sweet of you to say. I hope you get the science communication internship! My fellowship through the Biosphere started this whole blogging adventure, and I am still incredibly grateful to have gotten that experience. I am quite sure I wouldn’t have a blog nor the photography skills I have now if I hadn’t gotten that fellowship. Hope you will get to do the same! Awesome, congratulations DW! A tremendous accomplishment, and here’s to the next 1,000,000! Wow! That is a very impressive accomplishment – but I can sure see why people are interested in your informative blog! You deserve this recognition, Chris! With so much empty-headed stuff on the net now, or worse, misinformation, it’s nice to read about a subject I enjoy from someone who’s knowledgeable but never pretends to know it all. Anne’s right. I bet you’ve got far more than a million hits as many of us read your posts from our email. I only subscribe to 5 blogs – yours, Sean McCann’s, Paul Bertner’s and 2 others. All are about nature, usually ‘bugs’! Aw, thank you so much! That is so sweet! Very glad you enjoy the blog. Congratulations. Thanks for the great information. Congratulations. My thoughts are already on dragonflies as more and more emerge in my area this spring. It’s not surprising that so many others share my fascination with these beautiful little creatures. Still, a million is a huge number! Thank you! Here’s hoping you’ll have many amazing dragonfly adventures this summer! Congratulations! I really enjoy your blog – have been following it for about a year, and it has helped spark my own interest in insects! I am so glad! Thank you so much for reading. You’ve ALWAYS been my favorite blogger. Congratulations! Aw, thanks George! That means a lot. W00t! Way to go! 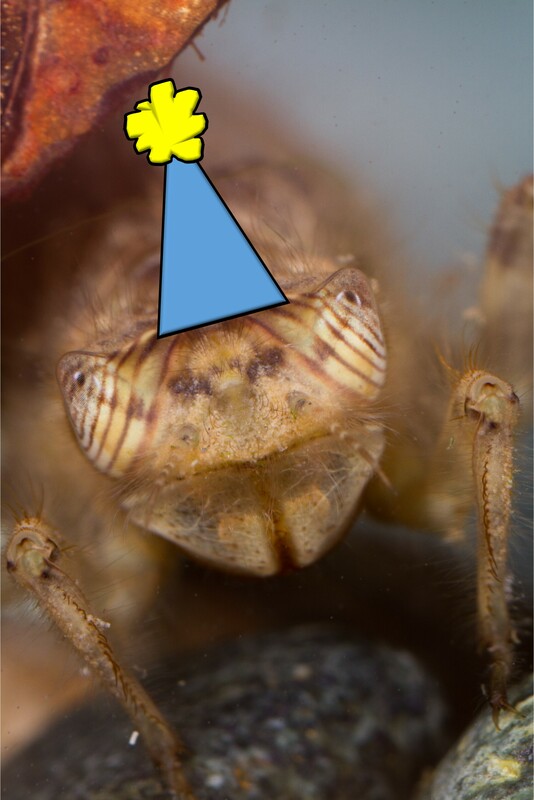 I love reading your posts about aquatic insects, as that is my particular “geek-out” topic, too. So glad you’re an aquatics geek too! They’re so awesome, so I like to spread the love. Thank you!! Really appreciate all of your comments and encouragement. Thank YOU for reading! I am glad I share a few interesting things with the world now and again. Congratulations! I enjoy the insects and am in the process of learning all I can. Thank you! And I’m very pleased to hear that you’re learning about insects. A person after my own heart!